The Seattle Symphony’s opening night of its salute to Jean Sibelius, led by principal guest conductor Thomas Dausgaard, was full of powerful, impassioned performances. The mini-fest continues through March 28. The hot ticket for classical music lovers this month is a cool Finn: Jean Sibelius, whose 150th birthday is the catalyst for a mini-festival featuring all seven of the Finnish composer’s symphonies (plus the Violin Concerto) over the course of just 17 days. The audience for Thursday evening’s pulse-pounding opening concert found out just how exciting the combination of Sibelius and the Seattle Symphony can be, with principal guest conductor Thomas Dausgaard on the podium. That this Sibelius-symphony cycle is a momentous undertaking was made clear in brief, to-the-point preconcert remarks from Finland’s U.S. Ambassador Ritva Koukku-Ronde, Finlandia Foundation President Ossi Rahkonen, Symphony president and executive director Simon Woods and Dausgaard himself. But the music had a lot more to say than the words. Dausgaard, who conducted the rousing tone poem “Finlandia” and the first two of Sibelius’ symphonies without a score, drew unusually powerful, impassioned performances from players who bowed and blew and beat with tremendous vigor. It was clear that this conductor knows how to light a fire in the orchestra, with vigorous, detailed, and occasionally acrobatic gestures showing precisely what he wants to hear from them: huge, sonorous brass and woodwind choirs, subtly crafted solo work, and strings who play with both color and clarity. 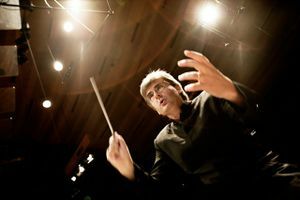 With principal guest conductor Thomas Dausgaard, repeats 8 p.m. Saturday. More concerts of the remaining five symphonies and chamber works continue through March 28; Benaroya Hall, 200 University St., Seattle; tickets start at $17 (206-215-4747 or seattlesymphony.org). These were performances that commanded you to listen, and to watch. Dausgaard is a conductor capable of taking off like a jet, so the players had to be ready to follow him. But he also likes to underline significant points in the score with long pauses that don’t release the players (or the listeners) too soon. Dausgaard uses strong contrasts to create drama — with brass outbursts, for example, that sound like sudden artillery fire in the Symphony No. 2. The results are thrilling, with completely involved musicians playing for an unusually attentive audience, and a conductor who is a passionate advocate for music that is unapologetically beautiful. Unfashionable in many circles during his later life, when 12-tone composers like Schoenberg were in the ascendant, Sibelius has earned an undisputed place in the symphonic repertoire — a place that Seattle audiences will get to explore further in the coming weeks. Don’t miss this chance.